The evolution of storage technology has brought us the SSD. 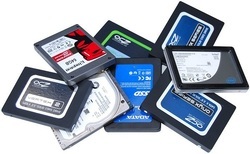 Solid state drives have replaced traditional electromechanical parts with flash memory. So what's it all about....read on!!! Faster random access times due to absence of slow parts and lower read latency times due to lack of disk seek time. Consistent read performance because physical location of data is irrelevant. Overall, solid state drives are faster, quieter and they use less power than traditional hard disk drives since there are no electromechanical parts moving around, using up energy, and making noise. SSD's make memory-intensive activities, such as PC gaming, video editing and photo editing snappier than ever. ....that is, until free space becomes fragmented on the drive. For info on maintenance for your solid state drives check out the Perfectdisk info on the software page!!! !